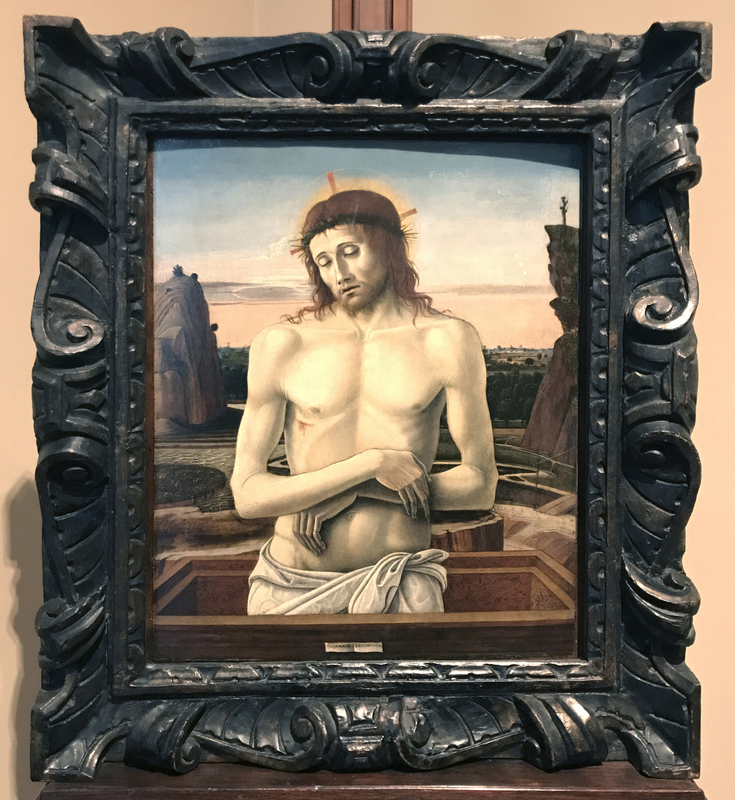 The exhibition currently on display in the National Gallery (Mantegna & Bellini: 1 Oct 2018 – 27 Jan 2019), which examines the mutual influence exerted by two artists associated by marriage and admiration, involved some of the exhibits being reframed or given exhibition frames. How else was the context of the time, and the expected mode of display within which both men were working, to be properly conveyed? The importance of this contribution to the exhibition needs to be emphasized. 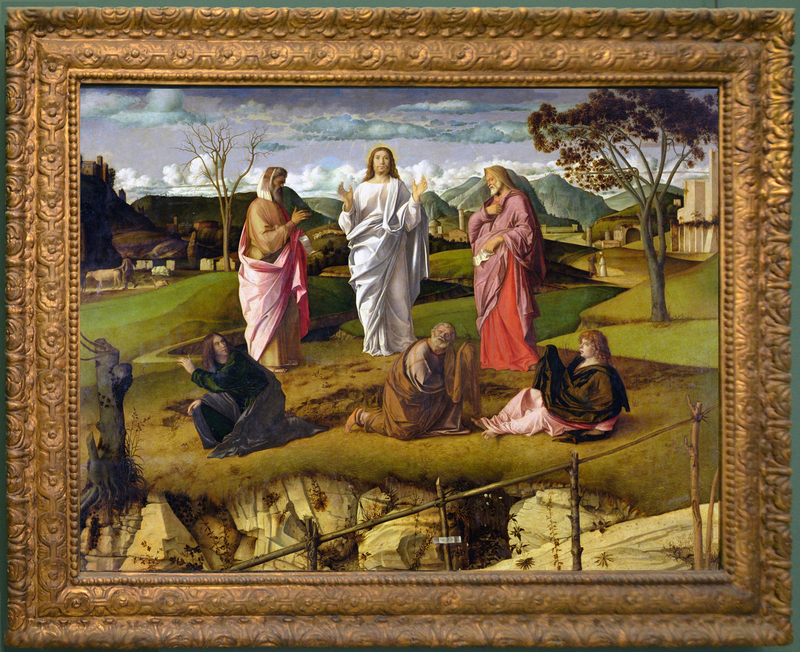 There are twenty-four paintings (either oil or tempera) by Bellini in the London arm of the exhibition, as well as attributions and circle of. 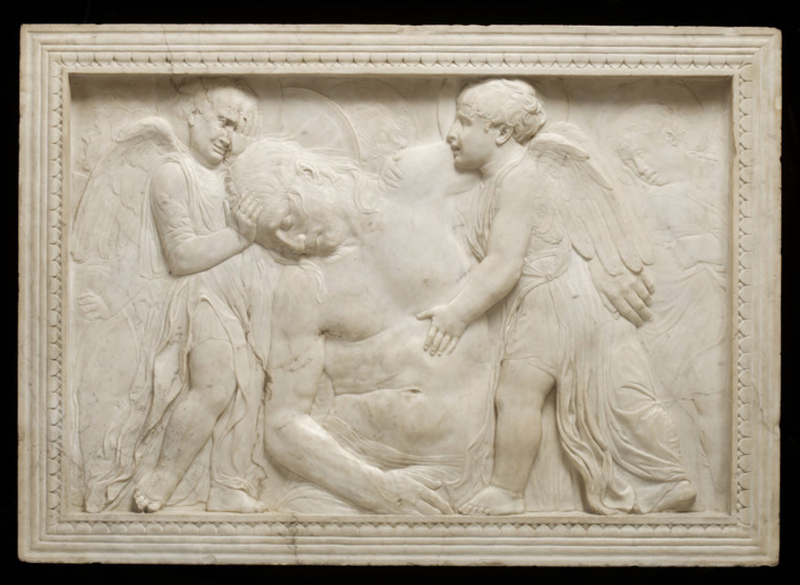 They are in the main fairly modest in size: The continence of Scipio (74.8 x 356.2 cm.) and The feast of the gods (170.2 x 188 cm.) are probably the largest, and this relative smallness is not, perhaps, unconnected with the state of their frames, none of which could be confidently taken to be the original. 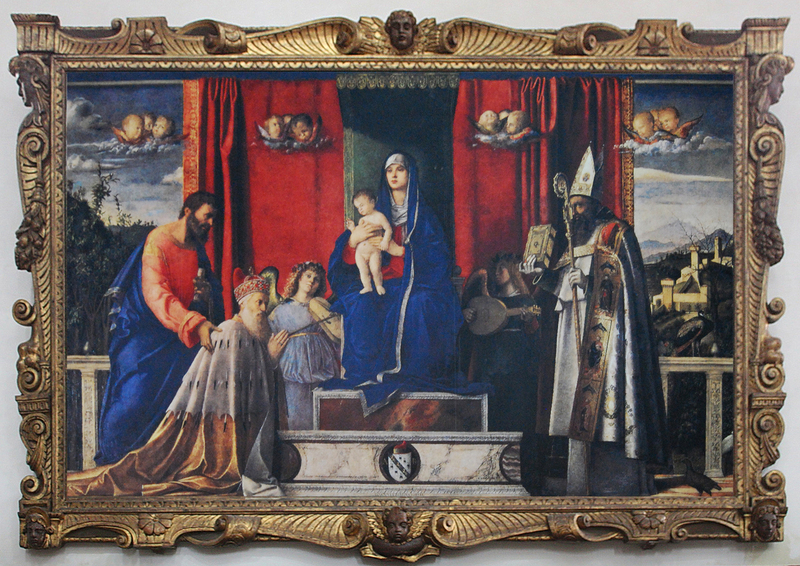 Bellini is one of those artists whose collectability has meant that his work has moved from owner to owner through the years, continually being reframed to suit a particular interior or hang – although it is also true that even some of his largest altarpieces no longer remain in situ in their architectural frames . Smaller works in movable frames (i.e. not in integral borders either carved from the picture panel or laminated onto them) were always peculiarly susceptible to changes in setting according to fashion or ownership, and modestly-sized Madonnas will have been presented in a number of different settings through the years. Even the famous Madonna dell’Orto, stolen from the church of that name in 1993, leaving behind it a reproduction of the painting, and a pathetically empty frame preserved on its altar with a notice commemorating the theft, had already moved its residence twice. It hung originally in the house of its first owner, Luca Navagero, and was then moved to his tomb in a different chapel in the church, before finally ending up in the Cappello Valier. 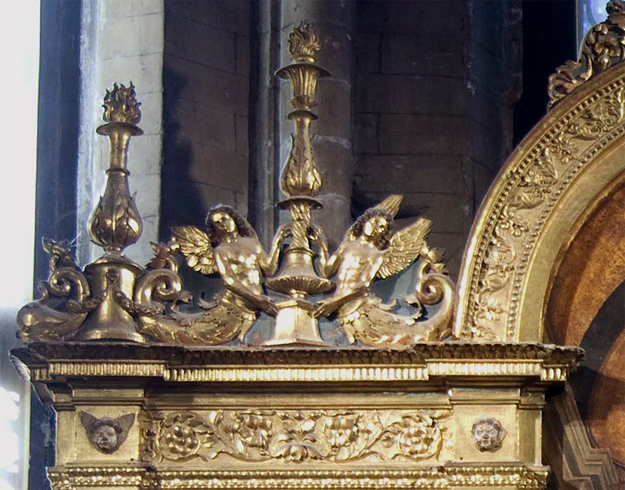 Its frame would almost inevitably have been changed – probably more than once – during these moves, and the frame on the altar is most unlikely to be the original. 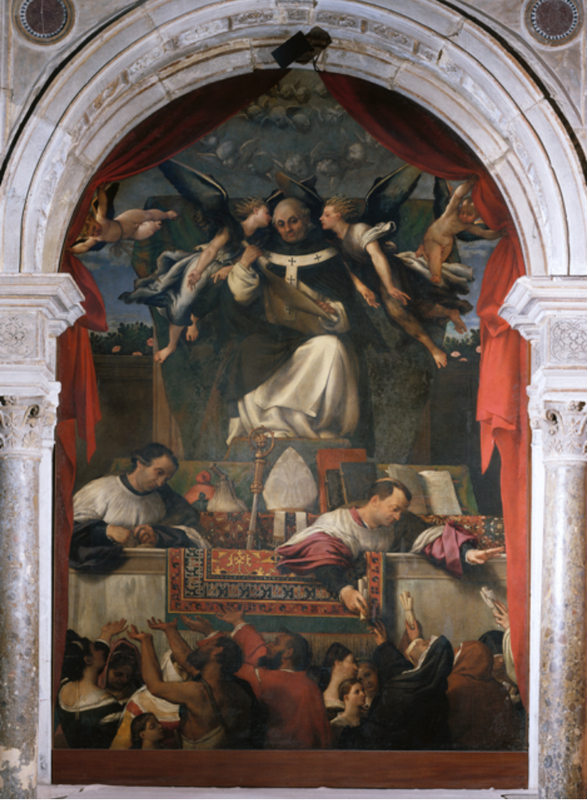 The so-called Barbarigo altarpiece, commissioned from Bellini by Agostino Barbarigo after his election as Doge in 1486, likewise hung at first in the patron’s own home, and was then bequeathed by him to a convent in Murano in 1501. In 1537 Titian painted an annunciation for the convent which replaced the Bellini altarpiece, and the latter was moved to San Pietro Martire, Murano, where it still hangs, and where it was given a late version of a ‘Sansovino’ frame in 1684. This might well, therefore, have been its third or even its fourth frame in the 200 years after it was painted. 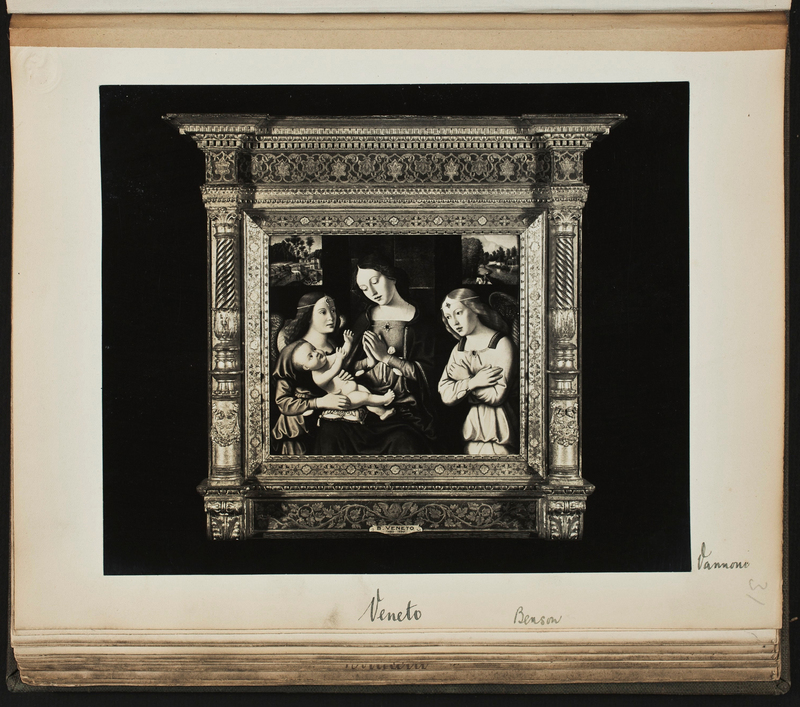 The contemporary framing of works by both Bellini and Mantegna is thus a question of researching the historic location and period of the specific work, and either acquiring an appropriate antique frame (if possible), or of creating an acceptable and meticulously-crafted replica. 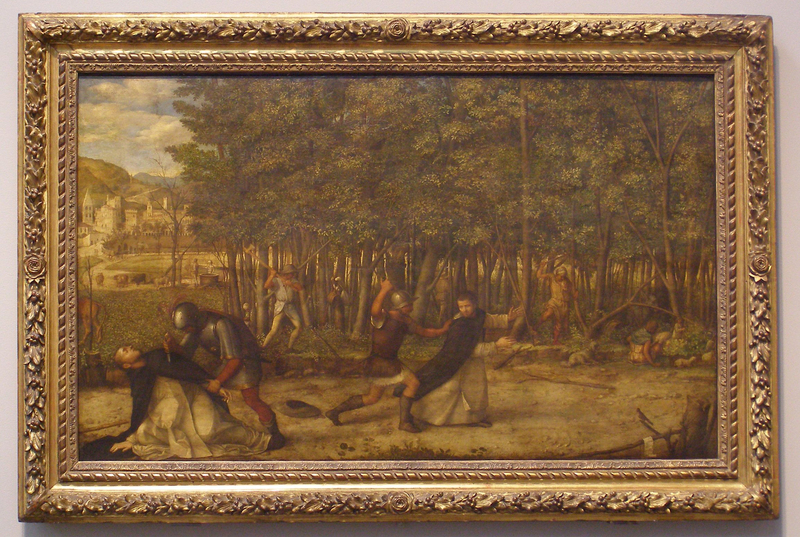 The process can be fraught with problems, however – for example, in the case of Bellini’s The assassination of St Peter Martyr. 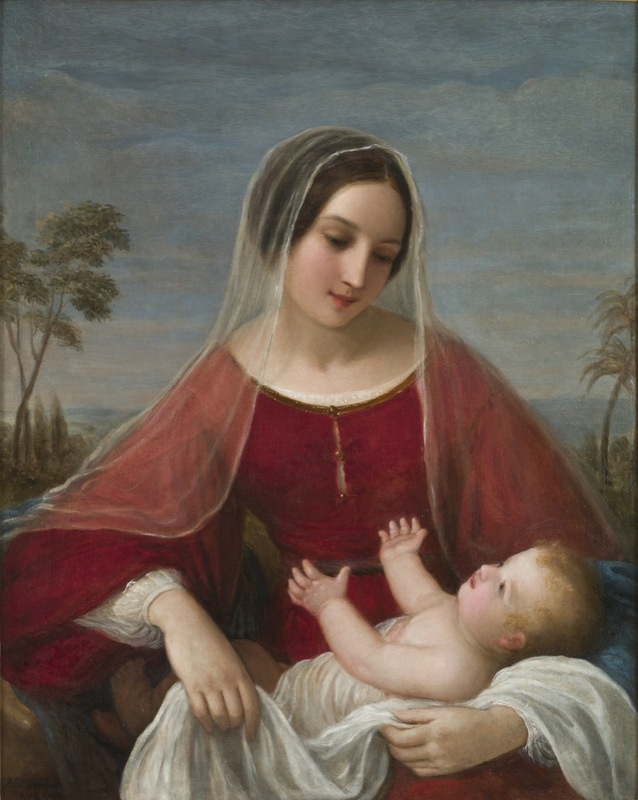 This painting was acquired in Venice in 1854 by Sir Charles Lock Eastlake (1793-1865), who at the time was a trustee of the National Gallery but not yet its director, and not, therefore, purchasing works of art on the Gallery’s behalf. He bought it for his own pleasure from a prominent 19th century Venetian artist and dealer, Natale Schiavone (1777-1858) , and it hung in his own house in Fitzroy Square until in 1870, five years after his death, it was given by Lady Eastlake to the National Gallery. Eastlake – like his friend Prince Albert, who took a great interest in the paintings newly acquired for the National Gallery and also in their frames – was concerned that these works should be properly displayed, sometimes commissioning frames to be carved for them in Florence, and at other times buying antique frames (or elements of frames) from the Venetian dealer, Antonio Zen . Coincidentally, The assassination of St Peter Martyr appears to have been passed from Schiavoni to Zen to pack and arrange the forwarding of it to the Eastlakes in London, and it is impossible not to wonder whether Sir Charles had arranged with Zen that it should be suitably framed for him at the same time . It certainly must have been framed to hang in Eastlake’s house, since he was particularly aware of the effect of setting on painting, and it arrived in a frame at the Gallery in 1870 – twelve days later this frame was sent away to be sized . In 1914 the painting was one of several attacked by a suffragette, when the frame may have been damaged and replaced. It was probably replaced again between 1923 (when part of a large convex ornamented frame appears blurrily at the edge of a photo taken in the Gallery), and 1930, when what seems to have been the frame in the image above (that previous to the current reframing) was altered to include a glazing door and to fit the painting. 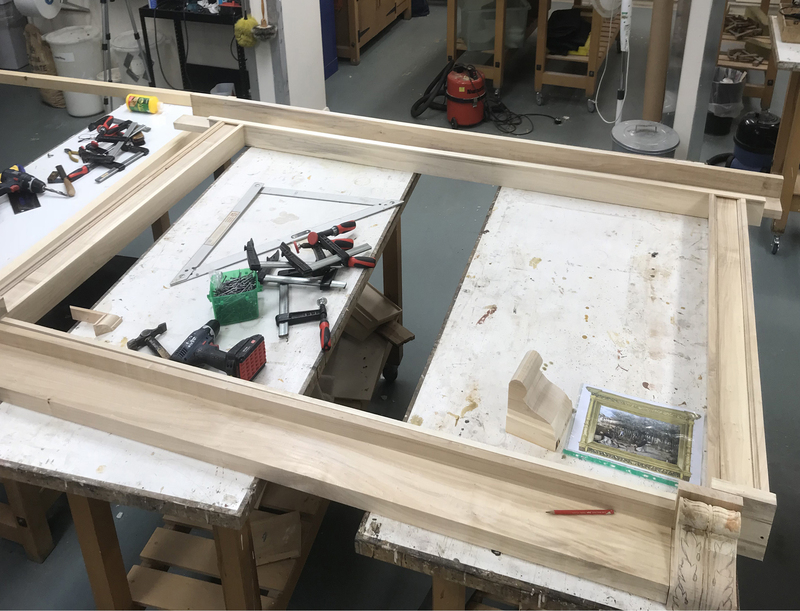 This process was reversed in 1990, removing the glazing door, but otherwise the frame remained in place until in 2018 the painting was cleaned, and made ready to take part in the exhibition. There is no denying that a Louis XIII garland frame, in a style half a century later than the painting and originating in a different country, could never have been a particularly satisfactory solution for this work. Whilst it is true that, if imaginatively done, diverse marriages can occasionally work very well, putting a French Baroque-style frame on an Italian Renaissance altarpiece is seldom going to work. 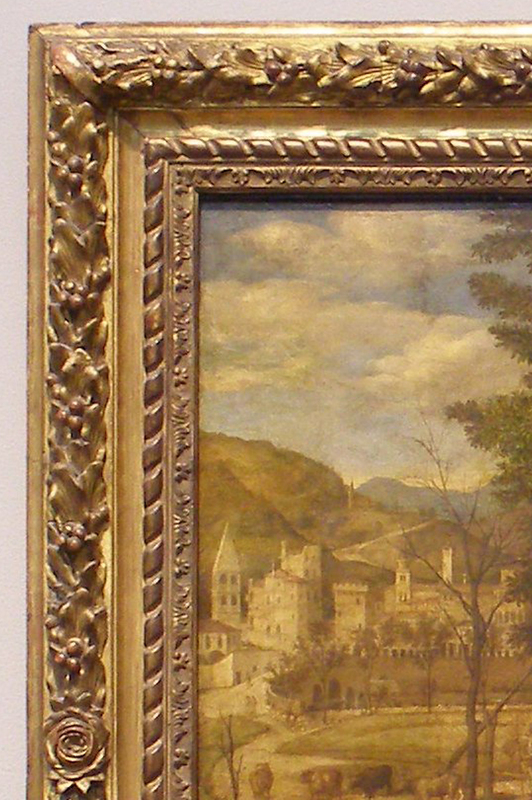 The picture had suffered from considerable overpainting and appeared dull and listlessly brown in tone; the dull, brownish finish of the frame mirrored this effect, flattening the panoramic space of Bellini’s landscape, muting its colours, and turning the mass of foliage into a two-dimensional band of white (or brown) noise, which echoed the repetitive flicker of the ornamental torus. The painting needed a frame which supported its subject and its locale, and one which, as well as reflecting and enhancing the drama of the scene, would open up the extraordinary perspective of the countryside, receding to the far blue mountains. The catalogue of the exhibition notes that both Bellini and Mantegna used landscape within their paintings in order both to create the illusion of the painting as an extension of the spectator’s or worshipper’s world, and to reflect the emotion produced by the subject, or to provide a foil to it . In a group of paintings within their collected works, the landscape has become almost the main subject, or is at least much more than a subsidiary element in front of which the action is taking place; and in the future this type of composition would have a great influence on the siting of the sacra conversazione within a recognizably local outdoor setting. 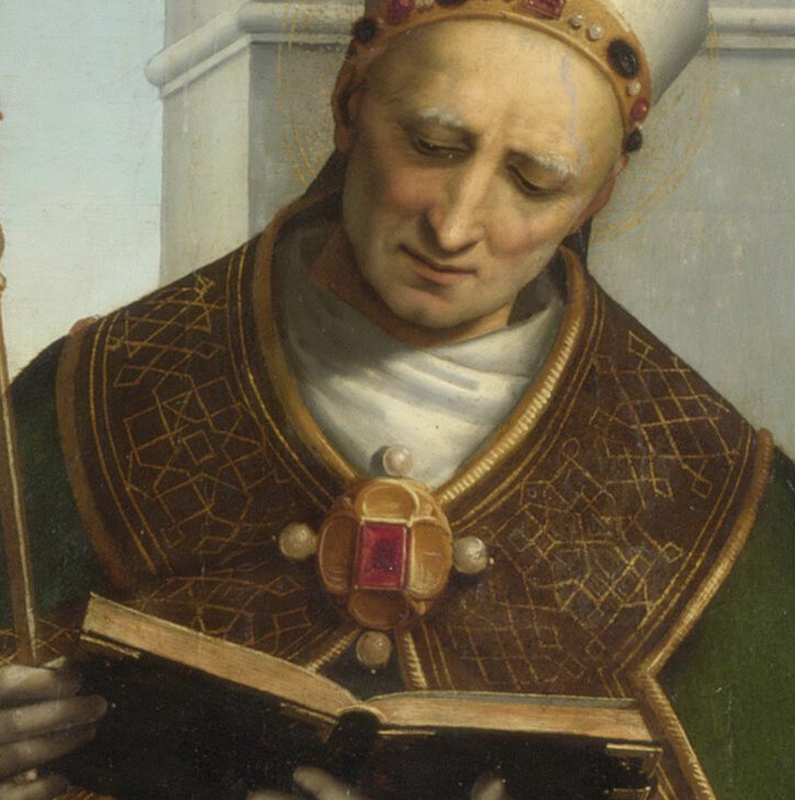 These paintings tend to be landscape in format, too – or at least squarer than the more usually upright altarpiece. The current framing reflects the same uncertainty as to the purpose of these paintings. 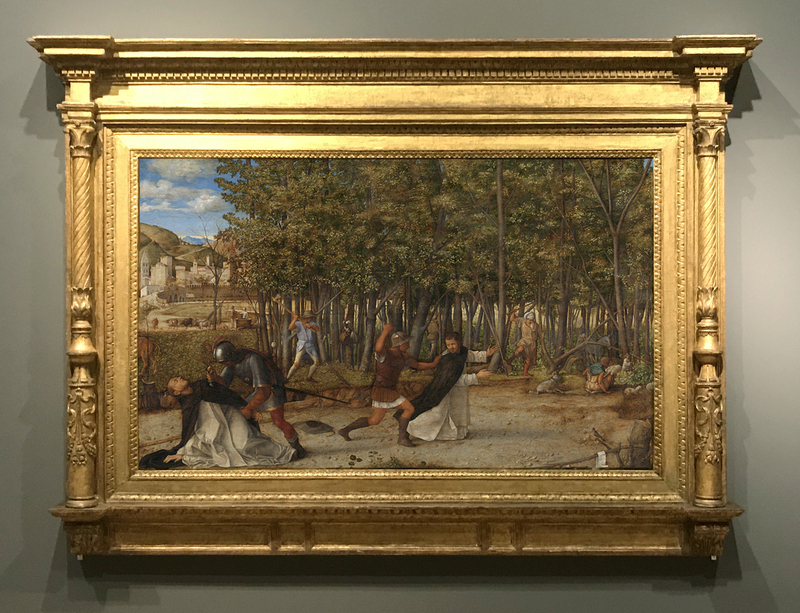 The Transfiguration in Naples has been given a rather heavy complex moulding frame, 1570s-1600, possibly of north Italian origin, which might have originally been used for a mythology or a portrait; The Adoration of the shepherds has a small aedicular frame, more Tuscan than northern in style, which may have been commissioned for it by the dealer Joseph Duveen, or adapted from an antique (the inlay at the sight edge could be suggestive of this). 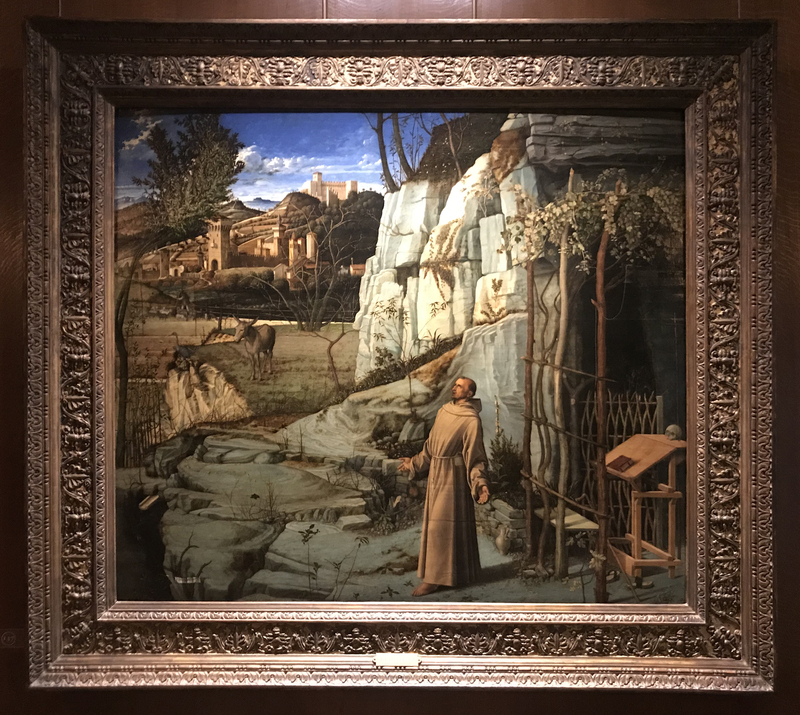 St Francis in the desert has a 20th century replica of a cassetta, after the type commissioned by Duveen for his wealthy, mainly American, clients; this particular painting was sold to Mr Frick through M. Knoedler & Co., a gallery which shared Duveen’s clients and probably also his framemakers . The cassetta has several orders of ornament and an opulently decorated frieze, which – like the frame on The Transfiguration – might equally have been applied to a secular subject. Since these two paintings are primarily landscapes within which scenes (which happen to be sacred) are set, then presumably they might have been framed in a similar way originally; but we have no evidence. 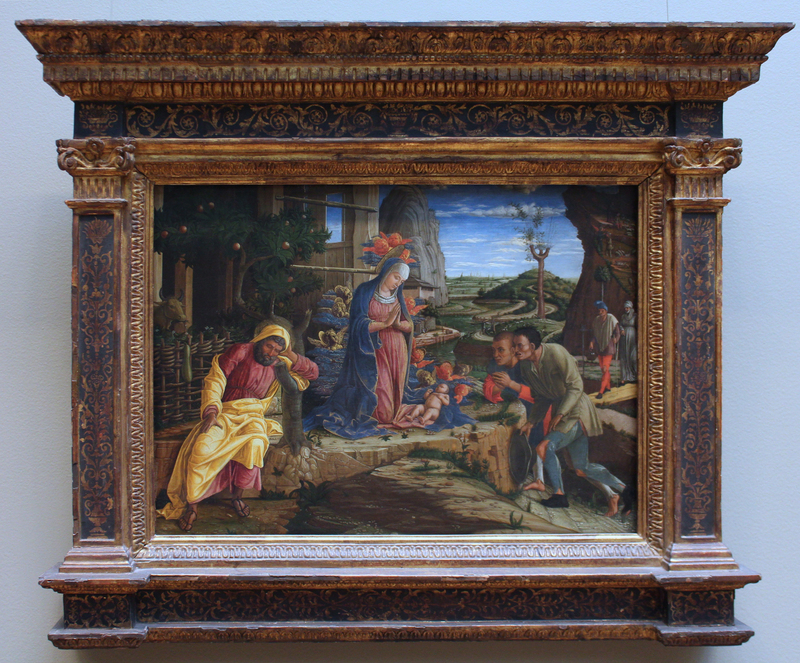 Mantegna’s Adoration, being more obviously a sacred scene in landscape surroundings, might qualify as a domestic altarpiece, and might therefore have been framed in version of its current setting; but again we do not know. 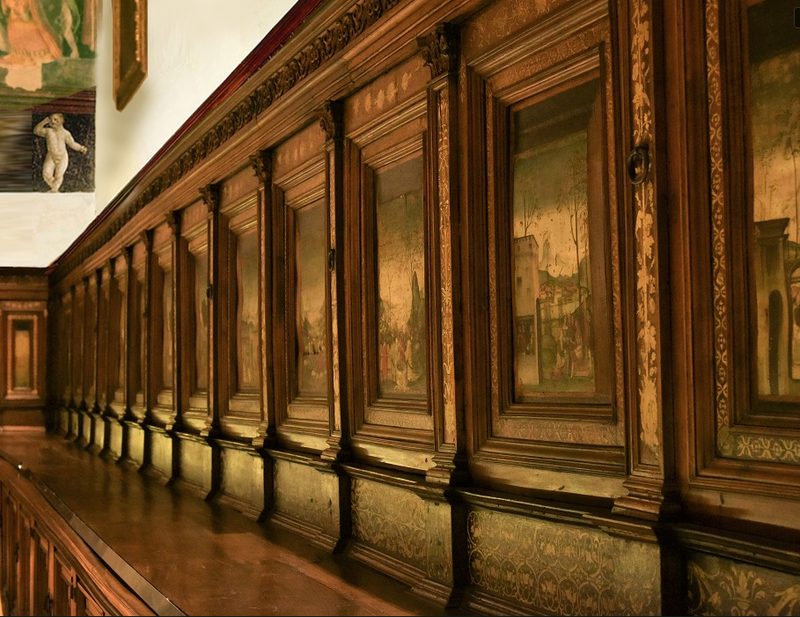 A comparison might be made, for example, with the peopled landscape paintings set into the carved and inlaid cupboards in the Sacristy of Santa Maria delle Grazie, Milan, which were created for Ludovio il Moro by Vincenzo Spanzotti and Padre Bandello at the turn of the 16th century. These landscapes are ‘framed’ by cassetta-shaped borders with inlaid friezes, set between pilasters decorated with vertebrate ornament, entablatures with decorative festoons and predella-like panels with further inlaid ornament. They are paintings within a sacred setting (comprising both cassetta and classical aedicule) but they are not altarpieces; they guard wardrobes which originally held the church vestments. 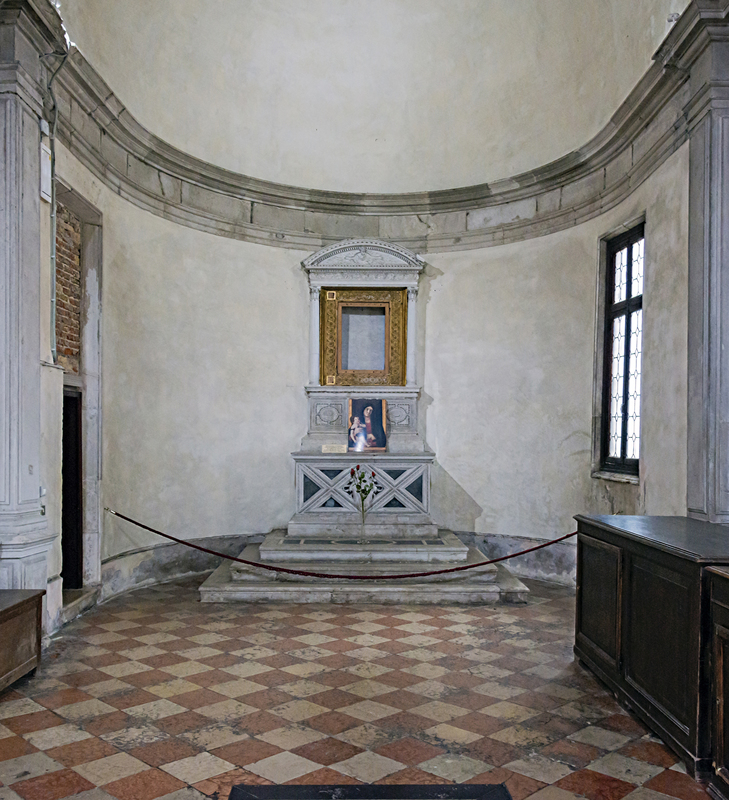 One method of finding an appropriate model of frame to reproduce was to look for paintings of the right era in Venetian chapels, sacristies, or other public spaces annexed to churches, within smaller churches where pictures might have remained less disturbed, or in public buildings other than churches. 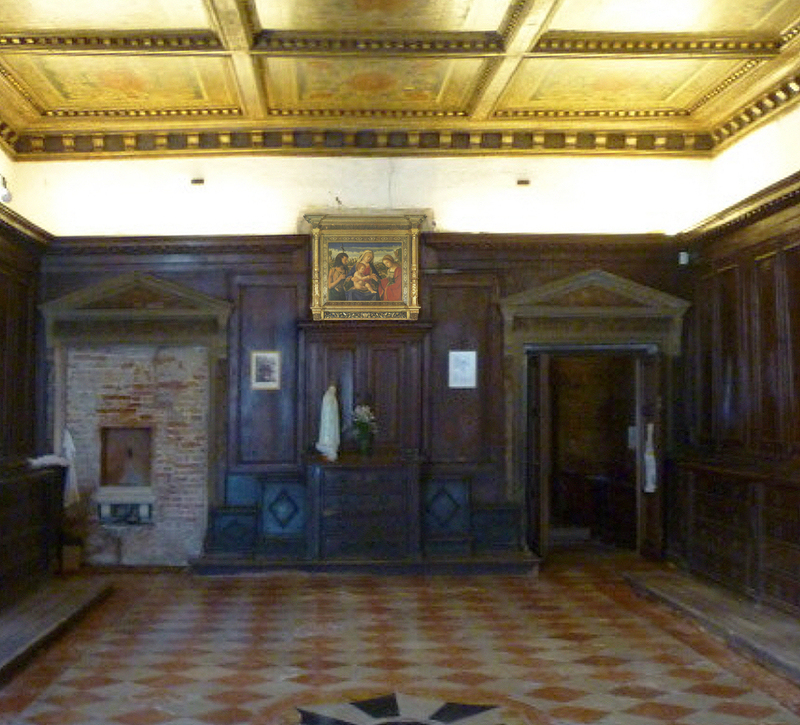 The sacristy of San Giobbe, for example, has held Previtali’s Madonna & Child with saints Catherine of Alexandria and John the Baptist since at least 1674 – a sacred scene set against a panoramic landscape, by a ‘disciple’ of Bellini’s and assistant in his workshop, who produced compositions influenced by his master . The frame is typical of Venetian aedicules of the late 15th-early 16th century, with turned free-standing columns carved like tiered balusters, with a tulip moulding holding the upper spiralled half of the column, and flowered festoons and ribbons on the lower part. It is reproduced in Guggenheim in a detailed drawing, as a rare and precious example of an aedicular frame of the era in a horizontal format. 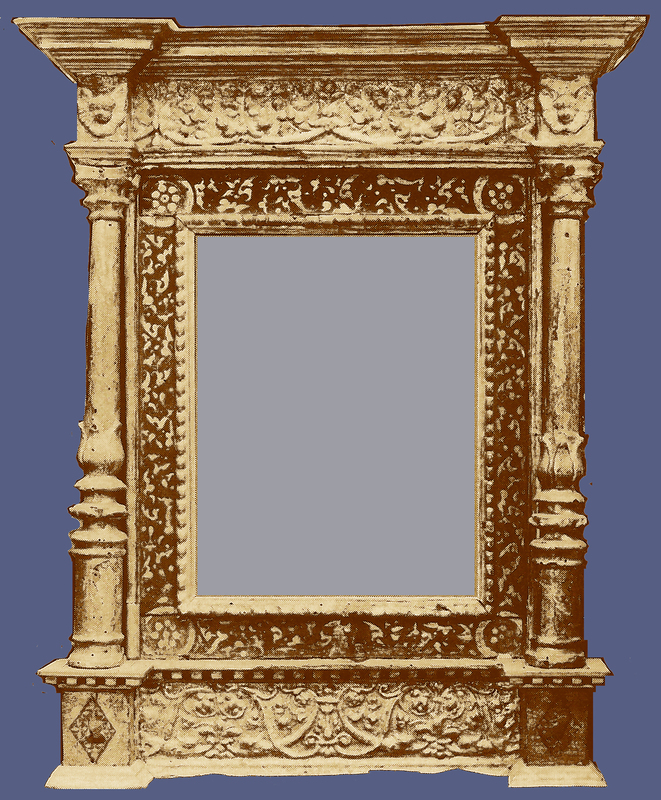 A very similar frame in an upright, portrait format is in the collection of the Ca’ d’Oro; this has the same turned baluster columns with tulip mouldings half-way up, the same shallow, projecting cornice, and the same inner decorative frieze; a restello or looking-glass frame in the Bardini collection also has the columns, cornice, and the scrolling foliate base of the Previtali frame . These baluster columns, slender, distinctive and decorative, seem peculiarly Venetian in their application to frames; although Paul Davies and David Hemsoll do not touch upon this appearance of the baluster in their examination of its appearance and popularity in Renaissance Italy; and the nearest references to Venice they make are to Milan and Bergamo . They do indicate written sources, such as Filarete’s and Franceso di Giorgio’s 15th century trattati; the latter was apparently the first to christen this the ‘cholonna a balausti’ or ‘cholonne a balaghusti’, connecting the swelling shape with the pomegranate flower, and applying it to a candelstick or candelabrum . 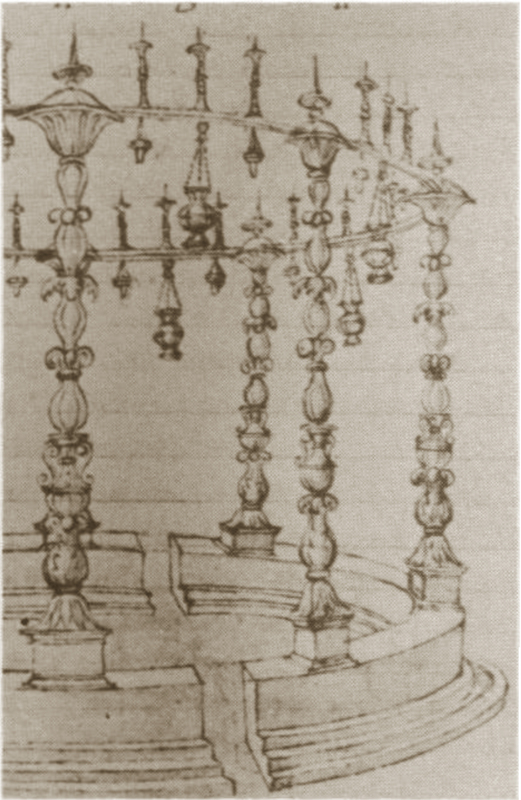 The Bellini family seem to have been ahead of the trend in their use of baluster candlesticks; Giovanni Bellini’s father, Jacopo, produced this design for an altarpiece frame in his book of drawings (on display in the exhibition), which is contemporary with, or even a few years before, Filarete’s trattato. 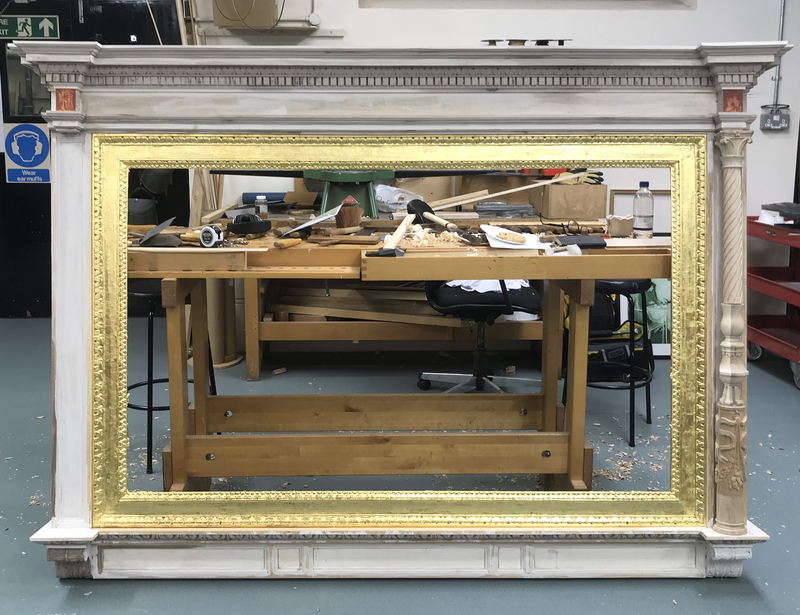 The structure of the frame takes a mid-century classical form, with a choice of pilaster for the client, the one on the left being more decoratively Venetian in style, and three baluster candlesticks, poised like acroteria at the angles of the pediment. 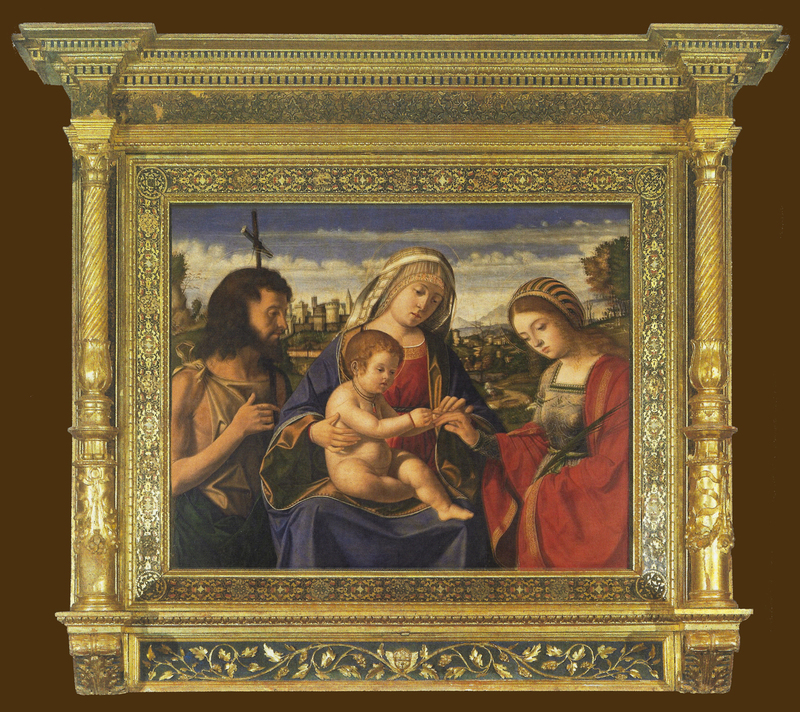 His son followed this about thirty years later with the Frari Triptych, the frame of which was carved and signed by Jacopo da Faenza in 1488. It suggests that there were other, now vanished, frames in the Venice of the last third of the 15th century, gradually evolving from the Jacopo Bellini to the Previtali design, and which may have reflected baluster columns elsewhere in the church, on candlesticks, monuments or sculpted altarpieces. 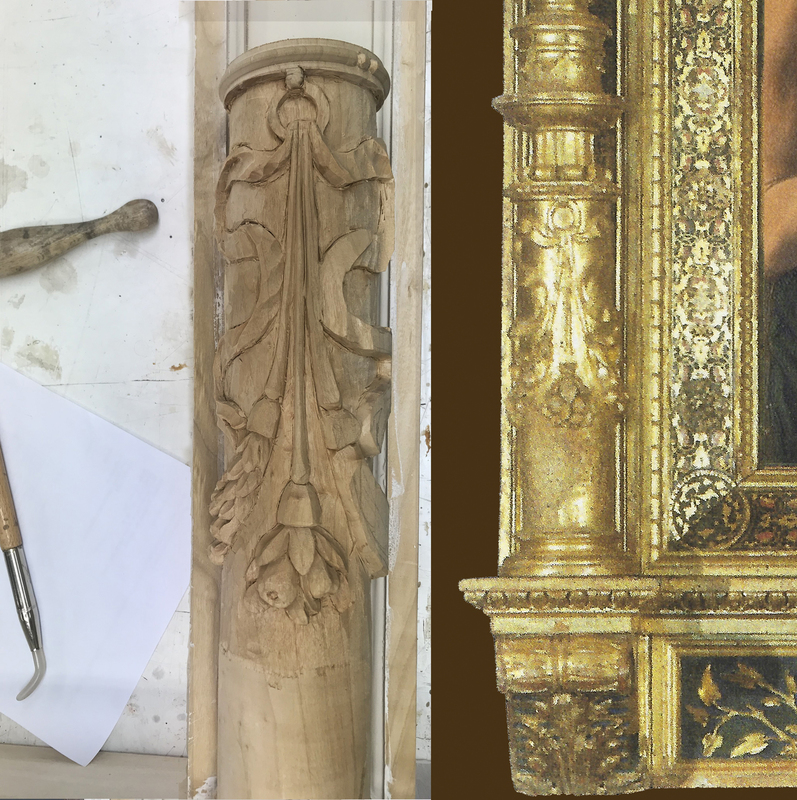 Looking at the frames illustrated above, from altarpiece to restello, it may be more possible to guess what was meant: a classical aedicular form, either with baluster columns or candlesticks. With all these references, the Previtali model, from a date very close to that of St Peter Martyr, seemed the most suitable model for a new frame for the latter: a particularly Venetian style of aedicule in landscape format from the turn of the 15th century. 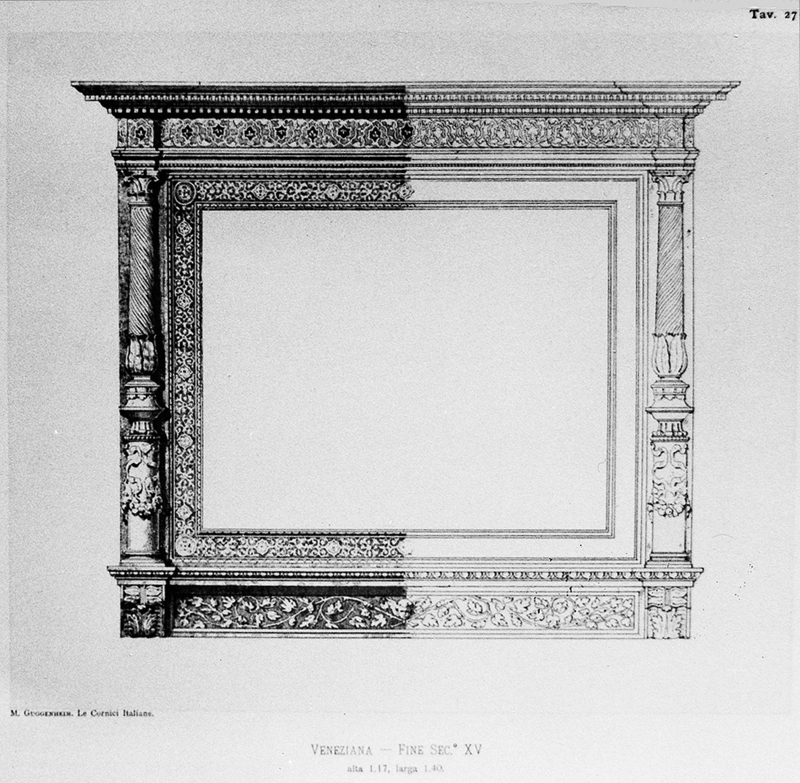 It must have been successful reframing choice, as Vannoni seems to have made two frames for Duveen based on the Guggenheim illustration; the other (which was photographed empty) has slight variations in the decoration of the friezes, while the spiral columns wind (bizarrely) in opposite directions from the frame on the Madonna. 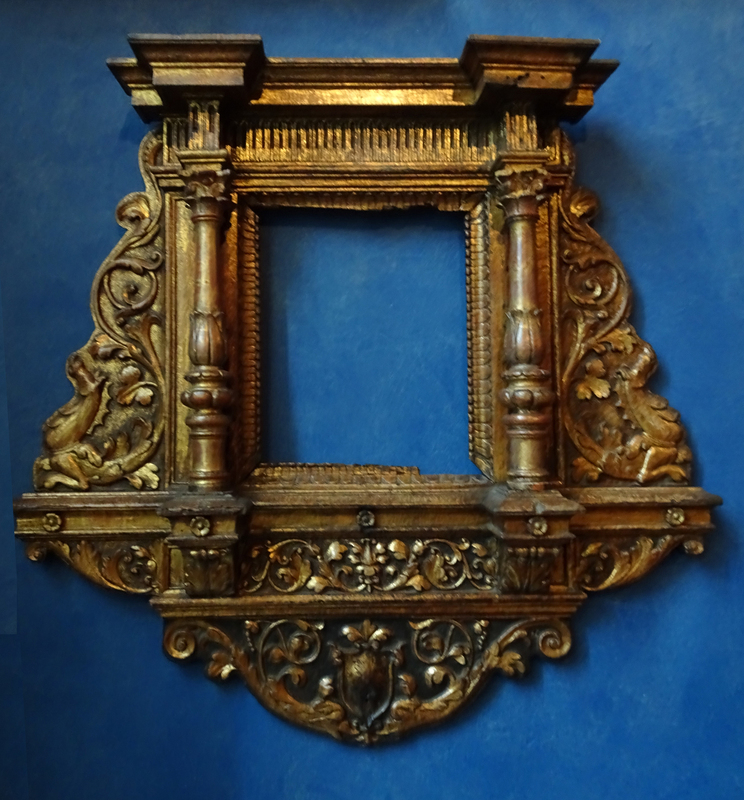 The baluster frame for St Peter Martyr (which was based primarily on the Previtali in San Giobbe, but also, of course, partly on the Guggenheim drawing as well), was designed in the framing department of the National Gallery by the Head of Framing, Peter Schade, carved by Peter Schade and François Loudwig, and gilded and finished by Amanda Dickson. 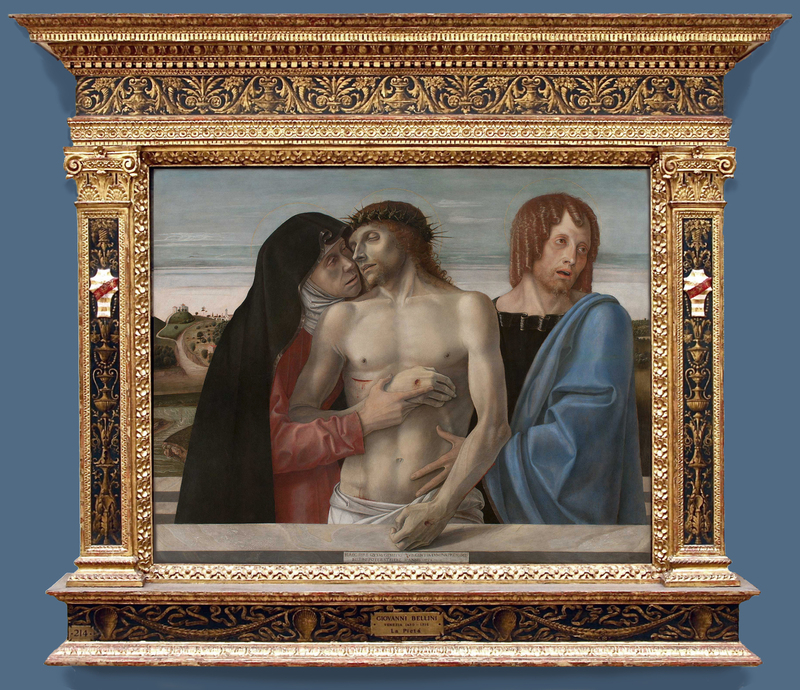 One particular painting may apparently have retained its original frame – the Pietà in the Brera (not in the exhibition); if so, it is possibly the only one of Bellini’s smaller sacred works to have done so . 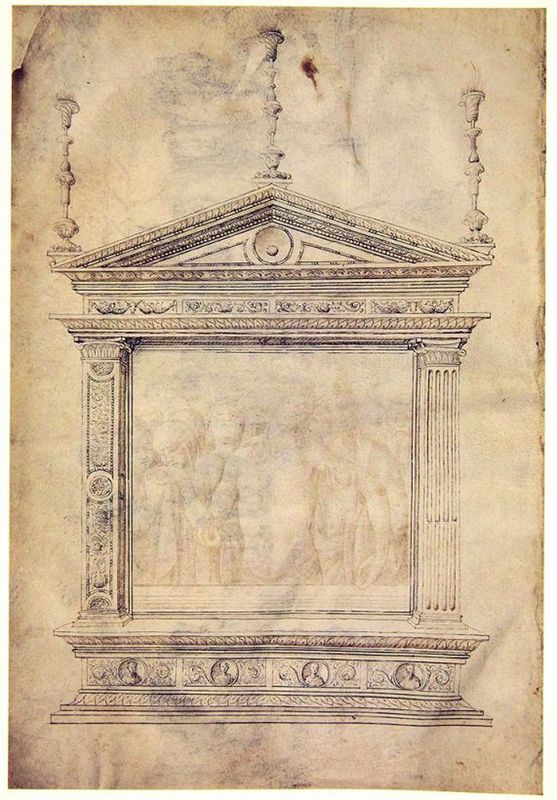 The earliest mention it receives is in an inventory of 1795, when it was in the collection of Marchese Luigi Zampieri in Bologna; shortly afterwards it must have fallen victim to Napoleon’s rapacious looting, since it was presented to the Pinacoteca di Brera, Milan, in 1811 by his stepson, Eugène de Beauharnais . The frame is Tuscan or possibly Bolognese in style, and the colouring of the owner’s or donor’s impresa on the lateral shields may have been altered over the years, as the main ground is composed of two metals. It is extremely richly decorated on every surface, indicating that it could possibly have been installed in a funerary chapel in a church; if it was a domestic retable, it must have been in an exceptionally opulent interior or private chapel. 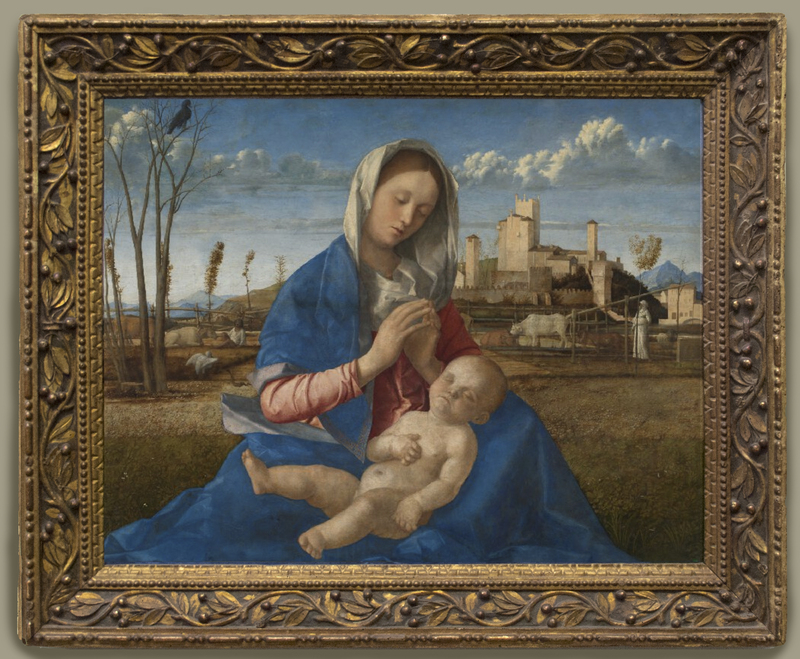 The National Gallery has also used an antique frame – but of quite different type – for the Madonna of the meadow. 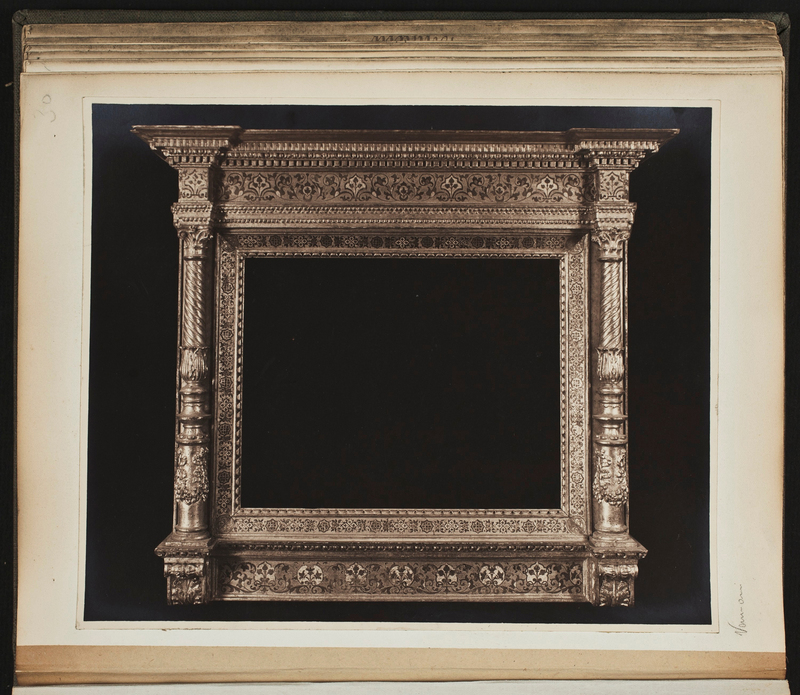 Previously it had hung in a 19th century reproduction aedicular frame, made in London and decorated with compo arabesques, which can also be seen in photos of the National Gallery taken in 1876 and 1920. 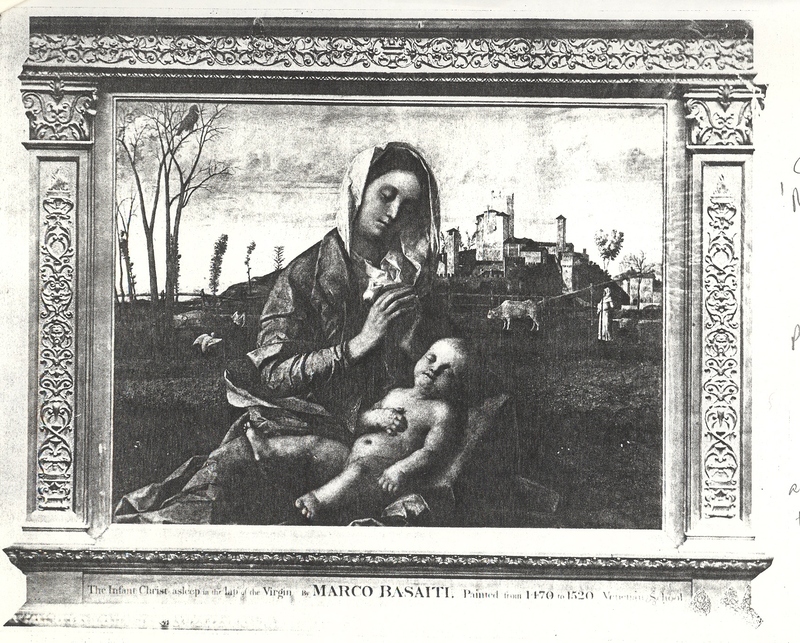 Unlike the Accademia’s painting, the Madonna degli Alberetti, this is another ‘landscape’ composition, in which the spectator is much more conscious of the countryside in front of which Madonna and Child are sitting, and the space is not so claustrophobically jammed up against a marble sill inside the frame, with no middle ground between the Virgin and the far trees. Here, the scene is sited beyond a window-like opening, the frame giving onto it like the frame of a casement, and the cassetta form, with its architectural ornament on inner and outer mouldings and its perspectival mitres, enhances this sense of an opening pierced in the wall. 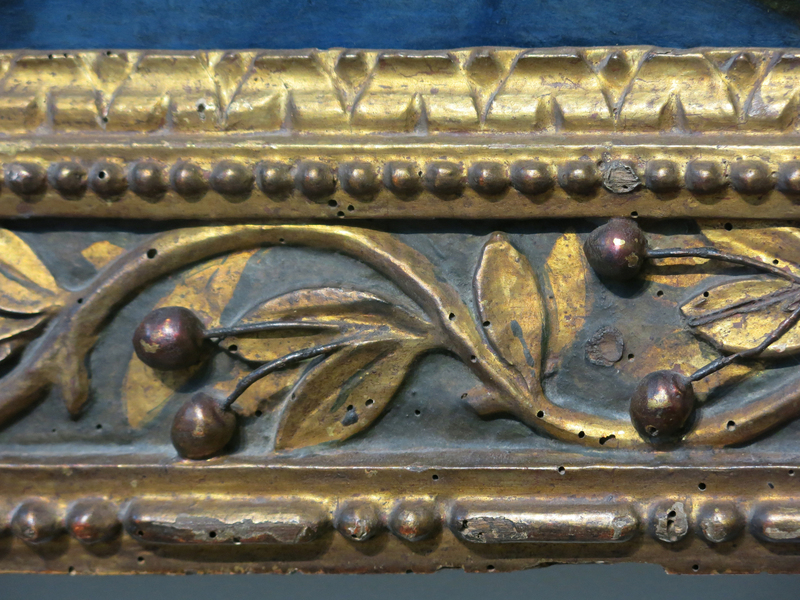 The canted frieze of the frame has a blue ground on which a garland of gold leaves and fruit undulates. These have been thought at various times to be either cherries or olives: cherries are the fruit of paradise, associated either with Christ as a Child or with the Virgin; olives symbolize (in the Old Testament) peace between God and man, made through the saving of Noah from the Flood, and (in the New) are another attribute of the Virgin, or of the angel of the Annunciation. 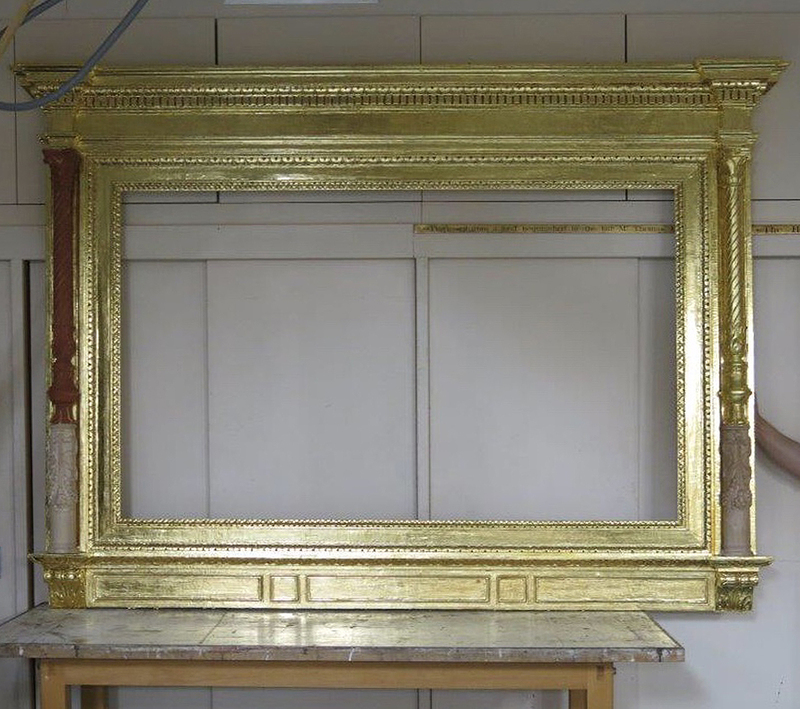 The frame retains its original gilding and polychromy, all of which has discoloured, including the fruit. These have very long stalks, made of embedded wires which are detached along most of their length, giving them a striking naturalism: they are probably cherries, because these stalks are relatively much longer than olive stems, and also because the fruit seem to have been gilded and then varnished with a red lacquer, which has subsequently turned almost black. In period, style and symbolic motif, therefore, this is a very appropriate frame for the painting. It is evident that it was originally designed to hang vertically, in portrait form, since the leaves run outward from the clasp now in the centre of the right-hand rail, flowing to the left along both top and bottom rails until they meet in the centre of the other side; but this is barely noticeable. In fact, the choice of this frame adds a fortuitous note of hope to the pietà-like painting, reminding the spectator that the death of Christ in the battle of good and evil will lead to the fruits of paradise. The decoration of the frame now on The Dead Christ in Berlin has a tenuous link with the present frame of the Madonna of the meadow, in that it seems to be an antique cassetta, and is decorated with a garland of undulating branches (this time they are definitely olives) crossing an undulating ribbon. In the flesh this motif looks so modern as to be not quite believable; but the frame has been cut, and is no longer centred at top and bottom, which is unlikely to happen with a reproduction frame. The choice of this very plain architrave profile with no carved ornament suits the monumentality of the painted forms and hints at the edge of a stone sarcophagus. 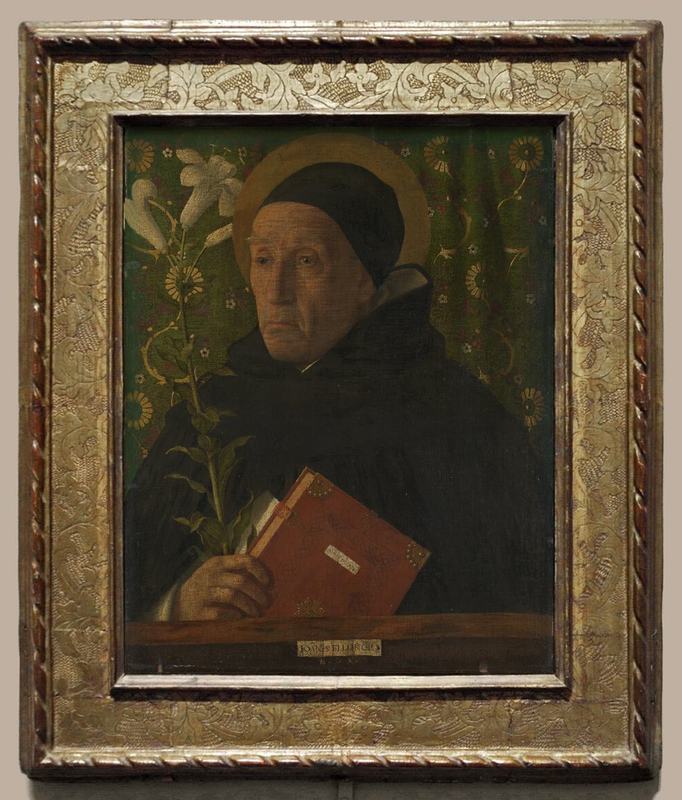 The National Gallery’s version of this subject has been framed very differently, in a rare 16th century parcel-gilt cassetta, with an intricate Greek fret on the frieze in mordant gilding. Although a little late for the painting, it’s an extremely successful union of painting and frame. 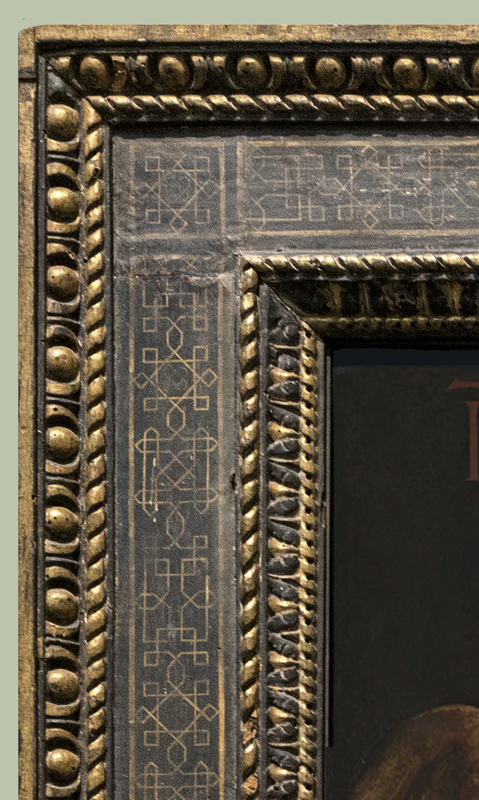 The spiral ribbons bordering the frieze of the frame are rather mystifying: both of them seem to run in two pieces, left and right from the bottom right-hand corner, meeting diagonally opposite at the top left. 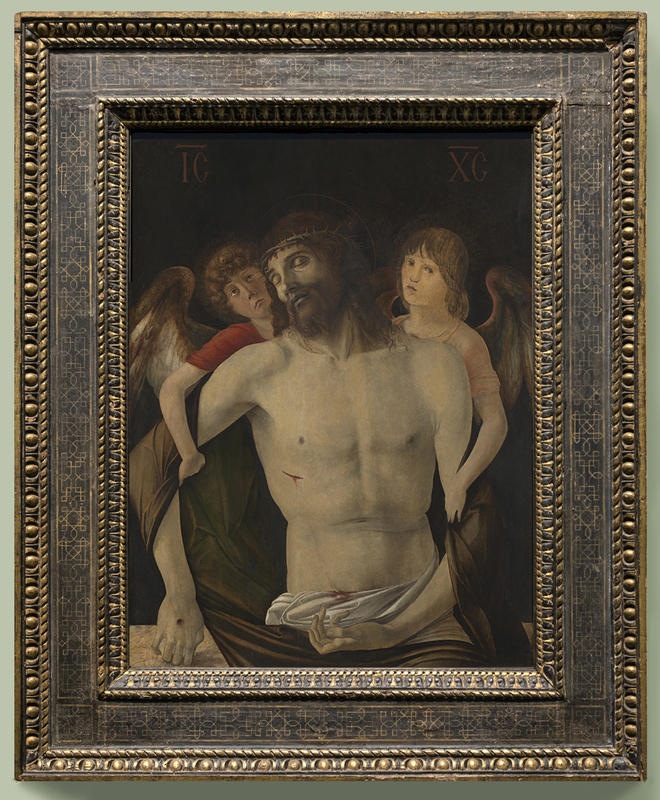 The parcel-gilding suits the painting very well; structure, carved ornament and painted/gilded finish reflect and enhance the medium and the restricted, earthy tones, where the profile and colouring of the frame on the Gemäldegalerie’s Dead Christ… reinforce its sculptural qualities and wider range of hues. Interestingly, the architectural mouldings and their finish on this cassetta look like Tuscan Mannerism, but the decoration of the frieze is influenced by 16th century designs of Venetian interlacings. 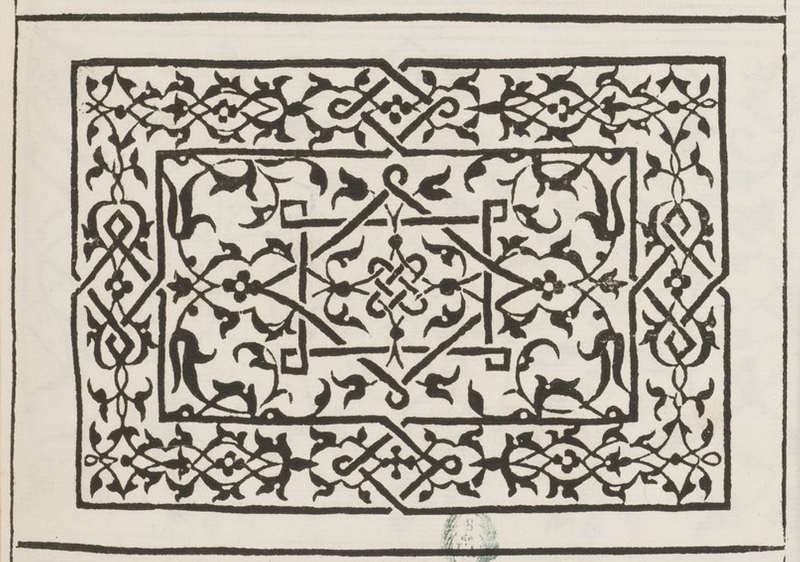 Pattern books for lace and other textiles were used by framemakers as the models for this kind of ornament; one particularly apposite example is that of Francesco di Pellegrino, La fleur de la science de Pourtraicture, which illustrates many patterns of entrelac or interlacing in its 57 plates . Pellegrino was a Florentine, but his designs were greatly influenced by near eastern and Islamic models, which entered Italy via the great trading post of Venice. 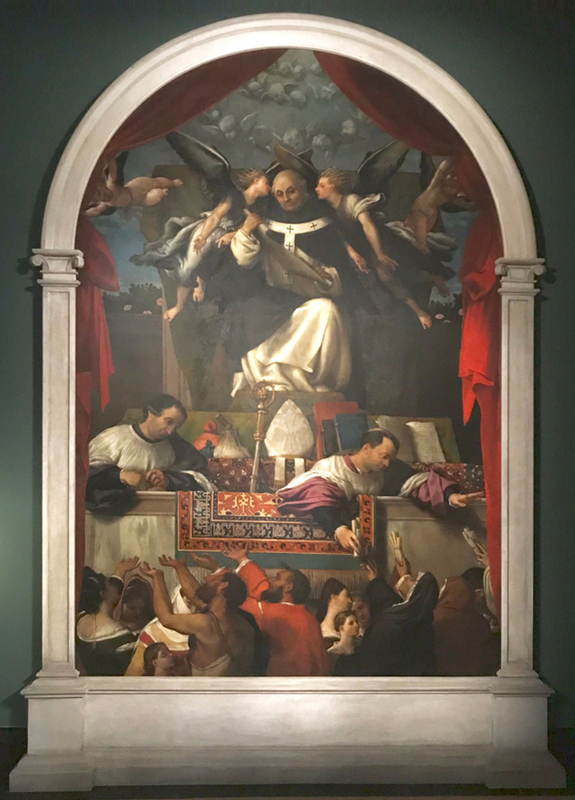 Coincidentally, a very closely-related example of interlacing to that on the frame of Bellini’s The Dead Christ supported by two angels can be seen nearby in the National Gallery, on the chasuble worn by St Nicholas of Bari in Raphael’s Ansidei Madonna. 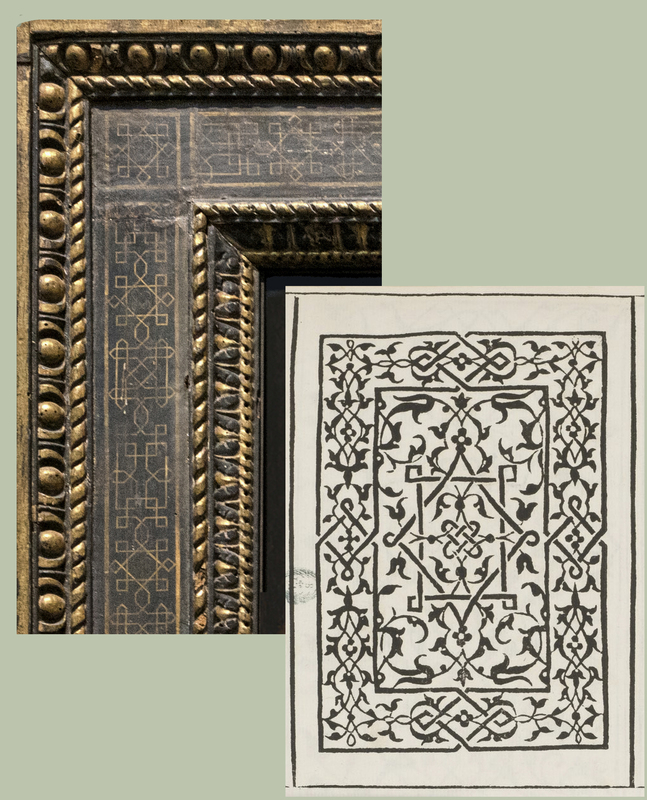 Although in life this would have been embroidered in gold thread on silk, it is practically identical to the pattern in mordant gold on painted wood of the frame used for the Bellini; a striking demonstration of the interconnectedness of the decorative arts at any one time. 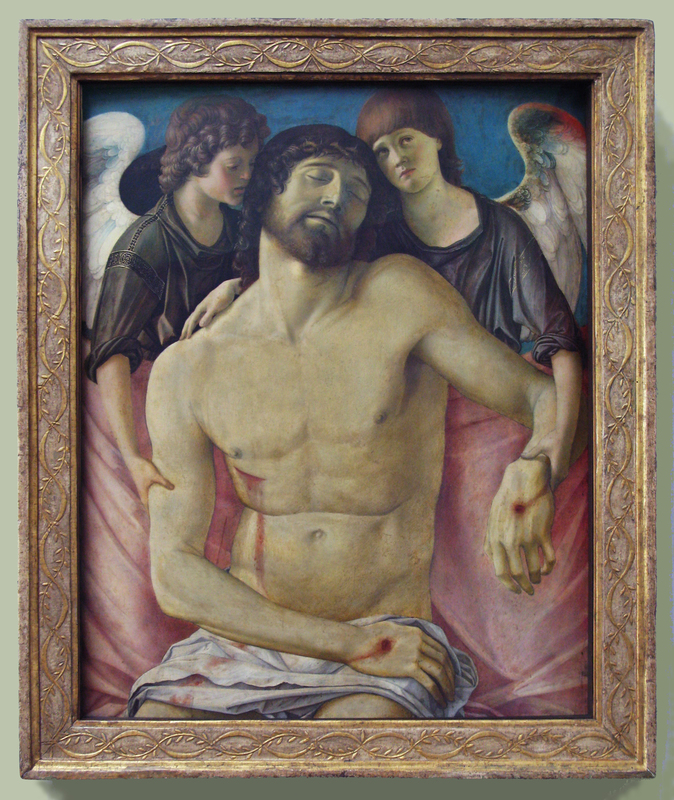 An earlier image of the dead Christ, a Pietà of the late 1450s, has had a far less happy reframing, into a small ‘Sansovino’ frame of a century or more later, which has been painted a uniform black – losing even the native colouring of the wood, which might have gone a little way towards harmonizing it with the tones of the painting. It overwhelms the image, the robust scrolls and flutes completely out of scale with the miniaturized detail of the landscape, and the fineness with which Christ’s face is depicted. Sometimes the coincidence of similar measurements and the same nationality can never be enough to outweigh the radical imbalances of date and style. 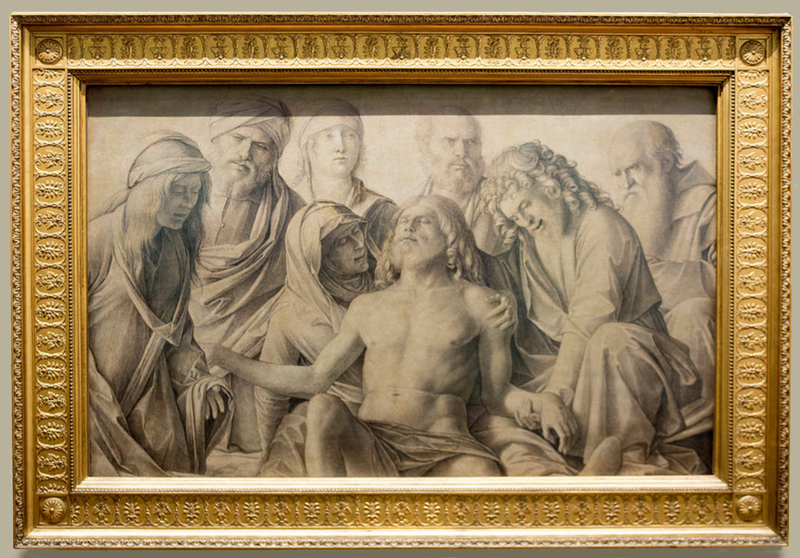 This is also true of the much later grisaille Lamentation in the Uffizi; it has fallen victim to the extraordinary loss of original frames in this gallery. The catalogue entry states that it was ‘presented to Ferdinand III, Grand Duke of Tuscany, in 1798’, but provides no subsequent provenance. Ferdinand had attempted to keep Tuscany neutral in the Napoleonic wars, but was forced to flee in 1799 and to abdicate two years later. Although he returned as ruler of the duchy in 1814, his collection must have been sequestrated, but there seems to be no way of telling at what point this striking work received such an unflattering and distracting frame. 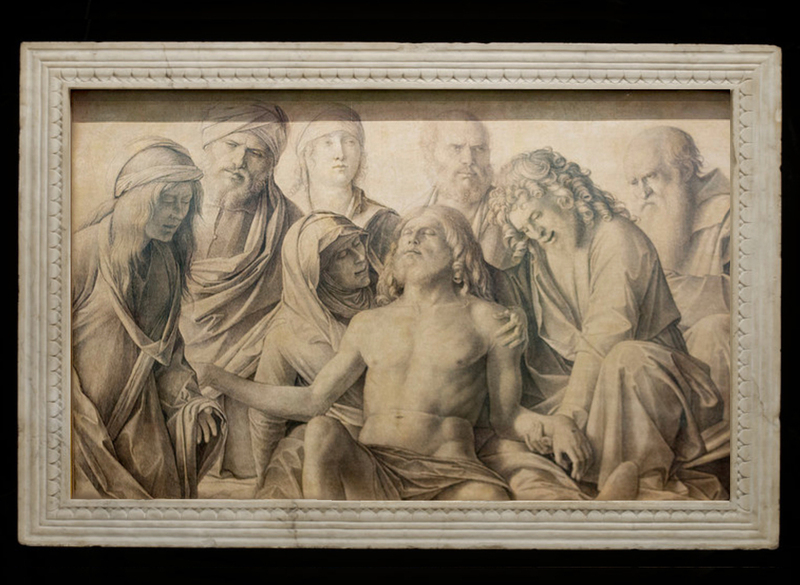 Given that the effect of Bellini’s monochromatic and highly-finished drawing is so reminiscent of a relief sculpture, a much more sympathetic result might be achieved by looking to the example of Donatello, a marble relief attributed to whom is included in the exhibition, as a reminder of the influence he exerted on both Mantegna and Bellini . 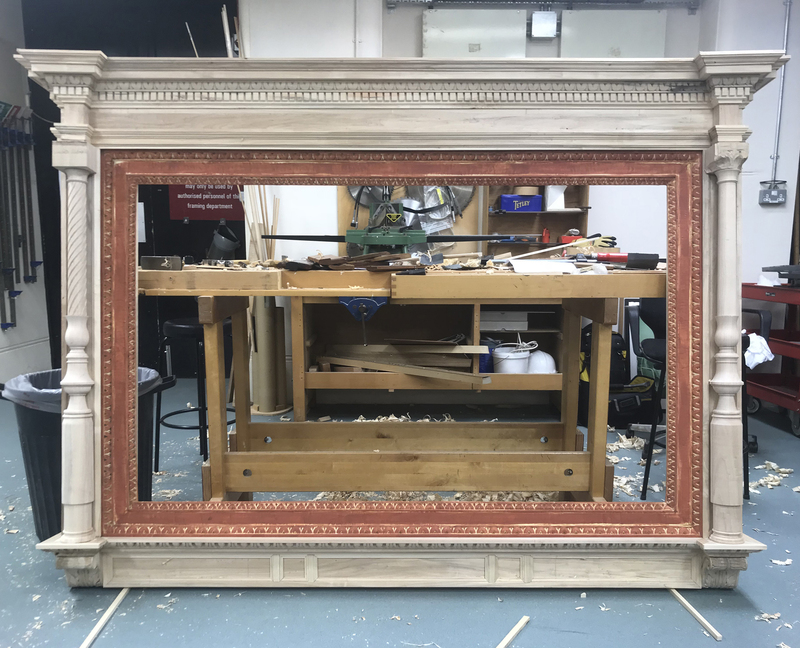 An arch-topped altarpiece frame has been built in the National Gallery workshops for an exhibit in the Lotto exhibition, also running concurrently in the Gallery; this is a plain abstraction of a 16th century architectural frame, with pilaster mouldings and carved capitals, and a painted faux-stone finish. It demonstrates what can be done to provide an appropriate setting which is historically, contextually and aesthetically accurate and sympathetic. In conclusion it may be suggested that this exhibition, as well as being of two painters, is also one of two halves, and that the half concerned with the presentation and display of the art is extremely patchy. 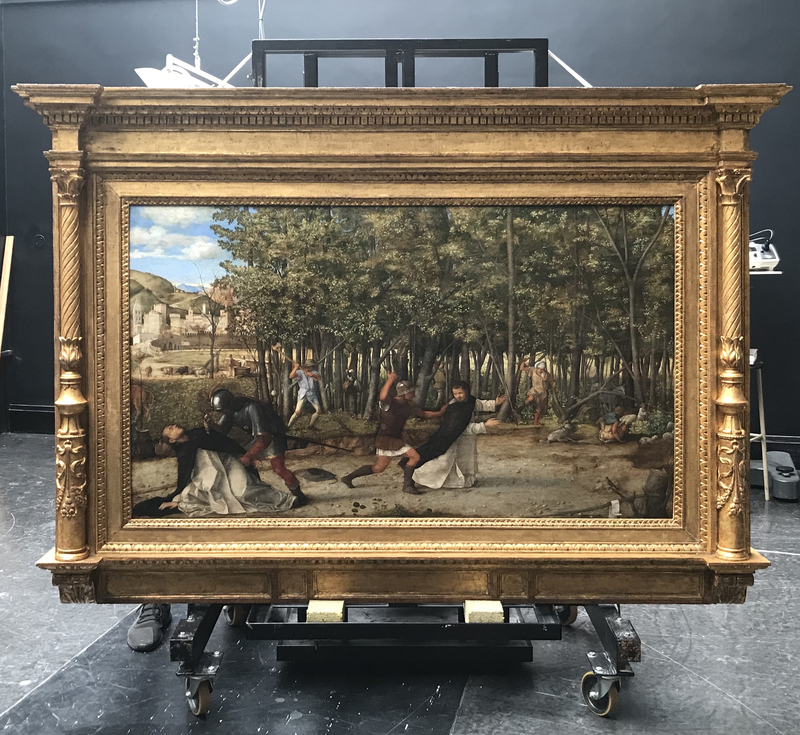 The National Gallery itself is unusually lucky to have a knowledgeable and talented Head of Framing, and it is greatly to his credit that he has been responsible for improving the overall standard of the frames belonging to the collection so much over a relatively short period. Sadly, this includes Bellini’s great altarpiece in San Zaccaria, Venice, of the Madonna & four saints, painted almost contemporaneously with The assassination of St Peter Martyr in 1505. This was looted by Napoleon’s troops at the end of the 18th century and installed in the Louvre, only returning in 1817. It seems then to have been installed over a different altar in the church, having at some point been cut down slightly at the bottom; so the apparent unity of physical setting and internal painted architecture is a fortuitous function of the repeated stone aedicules along the walls of the church. See The churches of Venice. National Gallery Technical Bulletin, ibid. …whilst etched designs on armour and other damascened objects might also be repeated in the punched gilding of frames. I have learned a lot reading this entry, and totally hope that the Uffici reframe B´s The lamentation over the Dead Christ following your Donatellian photomontage suggestion! I’m so glad that you enjoyed the article, and will pass on your comments as to the cleaning and the frame. It would, indeed, be marvellous if the Uffizi were to reframe their Bellini, but – given that the Doni Tondo is now apparently set into the front of a gigantic washing machine – I wouldn’t hold your breath! Bravo Lynn. A fascinating article around a neglected period with well deserved praise for the department. 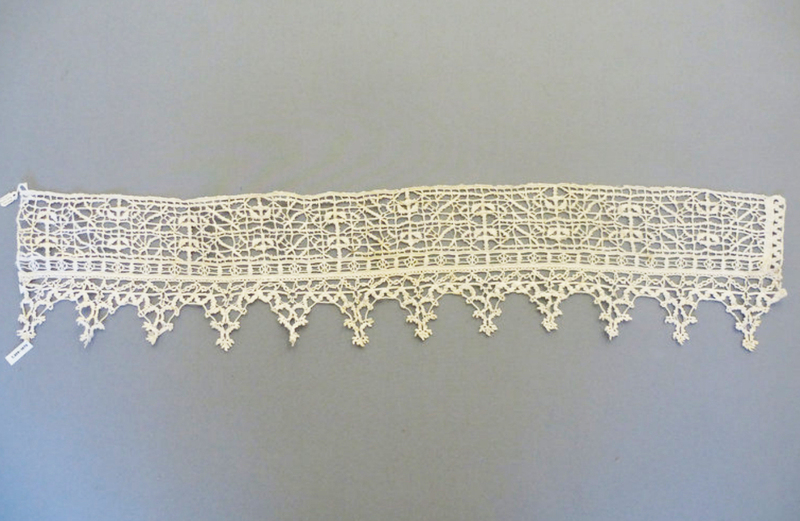 Interesting that lace pattern books were used by framers. Thank you, Paul; how nice of you! It was a very interesting piece to write, and people such as Joe Godla and David Pullins at the Frick, and Jill Dunkerton at the NG, were very helpful. I think that pattern books are key to some of the diffusion of design; they were not necessarily used directly, but were very influential in transmitting changes in fashion.